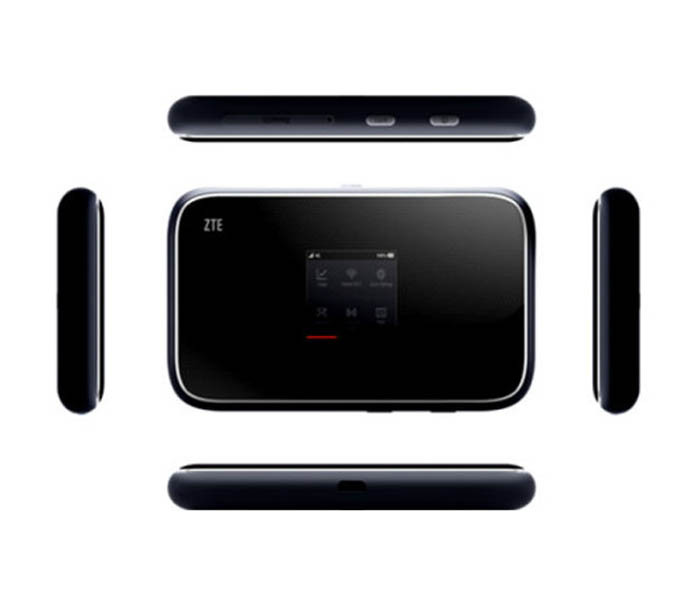 ZTE has presented a new 4G LTE Mobile Hotspot MF970 with ZTE MF285 LTE Router at the Mobile World Congress 2015. The special feature of ZTE MF970 is like Huawei E5786: it supports the LTE Advanced Cat6 with up to 300mbps speed for the downlink and has WiFi ac in the 2.4GHz and 5GHz range. We had seen the ZTE MF970 at the booth. You can see some features in this article. The demo at the booth is at white color. There is a 1.4 inch TFT LCD screen which gives the user an overview of the WiFi signal strength, speed and device battery status. Beside the screen, it shows the name “ZTE UFi”. On the top side, there are two connectors for external antenna. At the below side, there is a slot for SIM card. And the power button is also there. On the back cover, we can see the device model, IMEI number, serial number, SSID and password. ZTE MF970 is one of the few mobile LTE routers that support LTE Category 6, thus they could achieve the peak data rates up to 300Mbps in the downlink and 50mbps in the uplink. Of course, user must make sure a suitable LTE mobile network availability and a corresponding data plan. As we know, the LTE-Advanced Cat6 networks are available for many network providers in Europe and Asia. ZTE MF970 could support FDD-LTE Band 1/2/3/7/8/20/28/12/17 and TD-LTE Band 38/40. In addition to LTE cat6, MF970 also supports UMTS and GSM networks. ZTE MF970 4G Hotspot is based on the chipset Qualcomm MDM9230, which is reliable brand. ZTE MF970 also has a fast WLAN module for a mobile hotspot. It supports WLAN 802.11 ac which transmits both in the 2.4GHz and 5GHz. According to ZTE, the maximum connected users could reach to 14 devices via WLAN. The MF970 has a strong battery of 2300mAh, the battery could enable the operating time of approximately 8 hours. But the battery is irremovable, user must use re-charge it if power off. At the current market, there are already few LTE Category 6 mobile hotspots available, such as Huawei E5786, Netgear Aircard 790s. They are very popular in many countries. We will write new articles to show what the difference between them is and which one is better between them. So user will choose preferred the model.